When astronauts are in space they float around. You might hear people referring to this feeling of weightlessness experienced in orbit as ‘no gravity’ or ‘zero-G’. However, this is a common misconception and the official term is microgravity. In order to simulate microgravity and train for life on board the International Space Station (ISS), Tim Peake has had to do a lot of his training in what has become known as the ‘vomit comet’ – an aeroplane that flies in a parabolic arc (freefall curve under gravity). That means the plane falls away from Tim at the same rate as he falls towards the plane. For the 20-second parabolic period of the flight, Tim experiences weightlessness, which can make people feel very nauseous, hence the name ‘vomit comet’. However, even lots of 20-second microgravity experiences will not entirely prepare him for the effects of long-term microgravity. Microgravity makes a lot of everyday activities very tricky. Going to the toilet, for example, is very different in space from going to the toilet on Earth. When we feel the need to go to the toilet on Earth, it’s partly due to our body’s response to gravity. In microgravity, the human body does not feel the need to go, so Tim has to go to the toilet more frequently ‘just in case’. 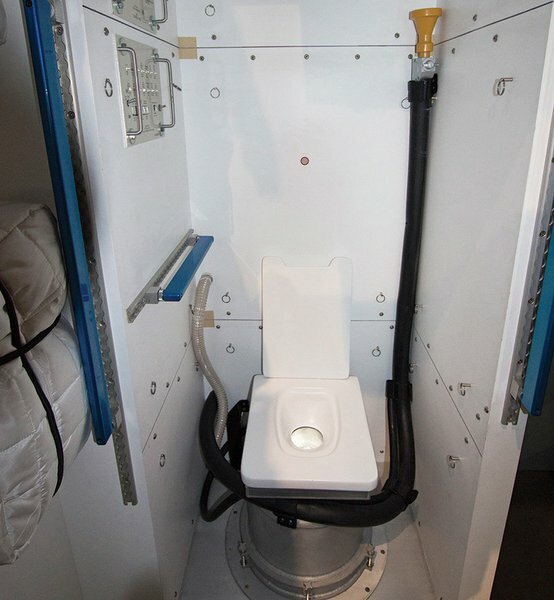 In addition, in microgravity it would be very easy for liquid and solid waste to escape from a normal toilet, which would be unhygienic and a serious health issue for the crew. That’s why Tim has to learn how to use the specially designed toilet as part of his astronaut training. The only time we might experience a vague sensation of what microgravity is like is when our bodies feel lighter than usual; for example, when a car goes over a bump in the road or when a lift starts to go down. Neither instance is a good time to need to go to the loo! Here’s a simple game that will help you understand what a big difference the effect of suction makes to astronauts using the toilet on the International Space Station. Ask your friend to hold open the large plastic bag/fishing net and stand still while you stand a short distance away and throw tennis balls into it. They shouldn’t try to catch the balls. How many of the balls do you successfully get into the bag? Now inflate the balloons. Ask your friend to hold the bag open while you try to throw balloons into the bag. Your friend should not move towards any of the balloons or try to capture them or to push them inside the bag. How many of the balloons do you get inside the bag? Collect all the balloons together again. Now give your friend a hand-held vacuum cleaner. This time when you throw the balloons, your friend is allowed to use vacuum suction to catch the balloons before stuffing them into the bag. How many of the balloons go inside the bag this time? 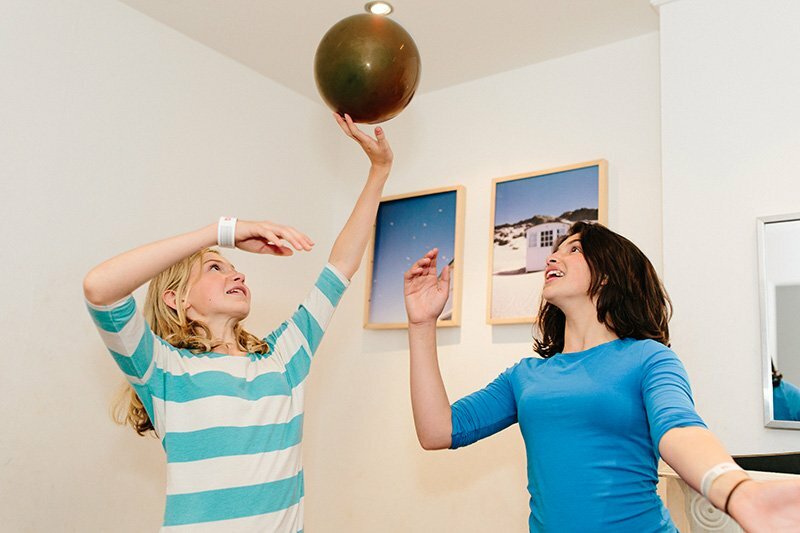 It is much easier to aim the tennis balls into the bag and they are more likely to stay inside because they are more easily influenced by gravity than the balloons. The balloons behave more like you might expect solid waste to in microgravity. So, as you can imagine, going to the toilet could get messy. And this is why the suction mechanism of the space toilet is so important to life on the ISS: the astronauts have to be sure that 100% of their solid waste will be captured and disposed of safely. How does the space toilet work? The collection of liquid and solid waste is carried out differently and requires different equipment. This game has focussed on the collection of solid waste. Liquid waste is collected via a tube with an attachment. These attachments are designed differently for men and women to take into account their differing anatomy. To ensure that all liquid waste is collected the tube has suction to make sure the waste is taken into a collection tank. The piping for this section of the toilet must be replaced frequently to prevent bacteria build up in the tubes. Solid waste is collected into a metal container that makes up part of the toilet. Before attending to their business an astronaut must ensure that the toilet is switched on and providing suction. The solid disposal requires an astronaut to precisely aim through a 4-inch aperture. Before each visit a new, specially designed plastic bag is attached just below the seat. The suction of the toilet prevents anything escaping once it has been released. After an astronaut has finished they detach the bag which snaps shut and is then sucked into the metal tank below. The toilet is then thoroughly cleaned. Astronauts must secure themselves in position in whatever way they find most comfortable so that their position is not compromised during their visit. Astronaut Samantha Cristoforetti shows how to use the International Space Station toilet.